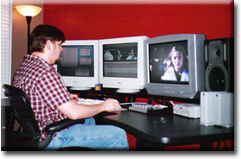 Adam Miller has been in Post Production since 1999. He started making independent short films in college at the University of Florida. After graduating, he went on to learn feature film-making at Valencia’s Film Program. He later worked at Adrenaline Films in Orlando for more than three years as the Chief Editor. Adam has worked on feature films including FLORIDA CITY and VIRGINS, Television programming such as HBO’s The Making of Band of Brothers, short films, documentaries, national commercials, music videos, and corporate and industrial videos. He first started working with Tom Mumme and Blue Juice Films on the short film EXECUTION OF A MAN. Since joining the Blue Juice team, Adam has edited all of Blue Juice’s projects, including a series of One Eleven’s music videos, ADVENTURE CHEFS North Carolina and INSIDE OUT with KARIN.